Memo, our metal goat is ready for Spring. He will come with me to the Good Food Expo on March 23. I will be providing a lecture on urban goat keeping. Please join us at 1:15 at the UIC Forum. The button above will provide you with the full schedule of lectures. See you there! arch 10 was a shock when Emma our youngest bred goat cried to me as I came to feed the girls their grain. She did not want to eat, which was very strange. I finally noticed the amniotic sack hanging from her behind. After speaking with my mentor, I decided that she was miscarrying. I had to finish a task with visiting consultants, and I returned to the garage and found Emma in heavy labor with a full term baby coming out. The race began as we quickly prepped for what appeared to be a large white kid. Emma had a struggle because the birth was a bit abnormal. She was exhausted when the baby girl slid out ten minutes after I returned to the garage. She could not move. Yet she had the energy to push out a second kid, all black and a boy. I moved both to her face to lick as seen above. Mia and My Shadow, appropriately named, have gained a quarter pound in two days. They are happily jumping and napping in the garage. After the surprise, we are so excited to have them. We also determined that they are the progeny of little Dodger, our last buckling to leave in October. Six month Dodger and five month Emma created quite a youth romance and babies. Now we are checking the other two doelings, Twist and Ophelia, avoid any future surprises. 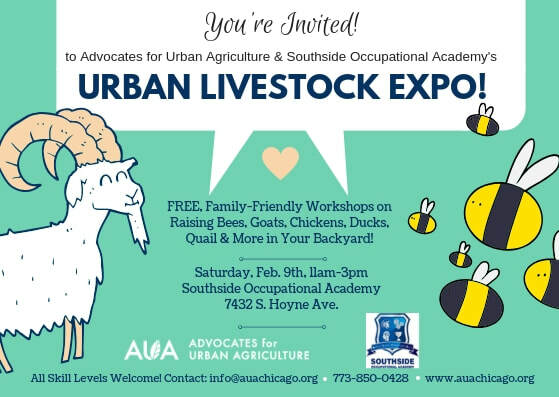 Join us at the Southside Occupational Academy on February 9. We will be bringing Ophelia and Twist to receive all visitors. 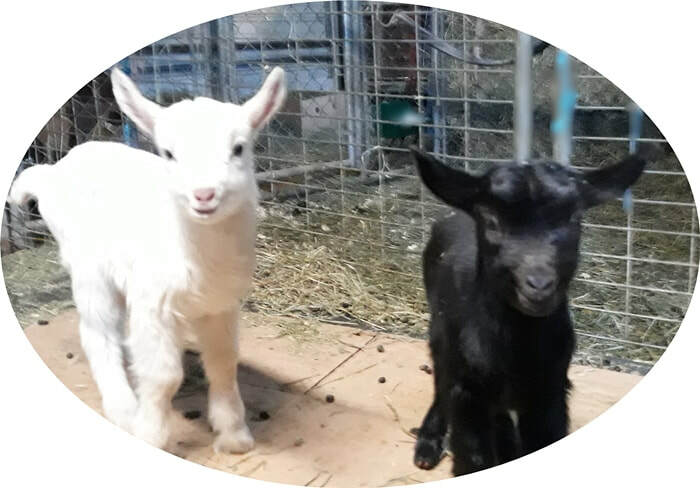 Deborah Neimann-Boehle of Antiquity Oaks will be speaking on nutrition in goats. 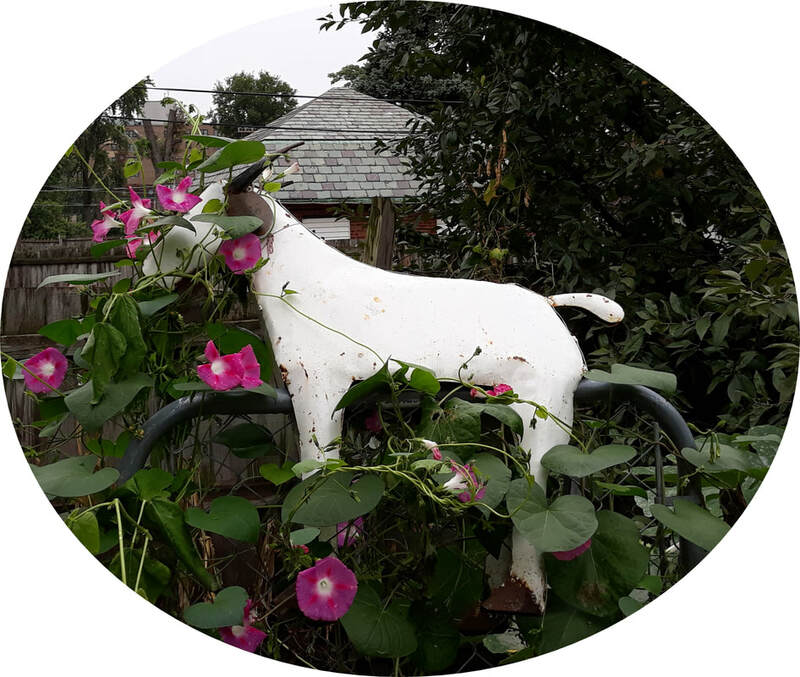 My focus will be about city goats and intense management practices required to keep them healthy. We will have a session in Spanish. We look forward to visiting with you there. Glennart Farm like all farms in Illinois has been preparing for the arctic weather this week. We stuff straw in holes in the eaves of the garage roof area, secure the windows, and close and seal the chicken door at night. The record HIGH tomorrow is expected to be -14. All the girls will stay inside that day. The hens will be released to eat inside the garage to prevent frostbite on their claws. The deep litter of the hay in the garage brings the temperature up 10 degrees. Hay and water will need to be checked with the goats. It appears we have an interloper alley cat sleeping in the 10 foot high bales of hay. He/She has been eating the food and using the garage litter box. Today we woke to 5 degrees which is slowly falling with the increased wind to zero. Our side pen is secure from wind. 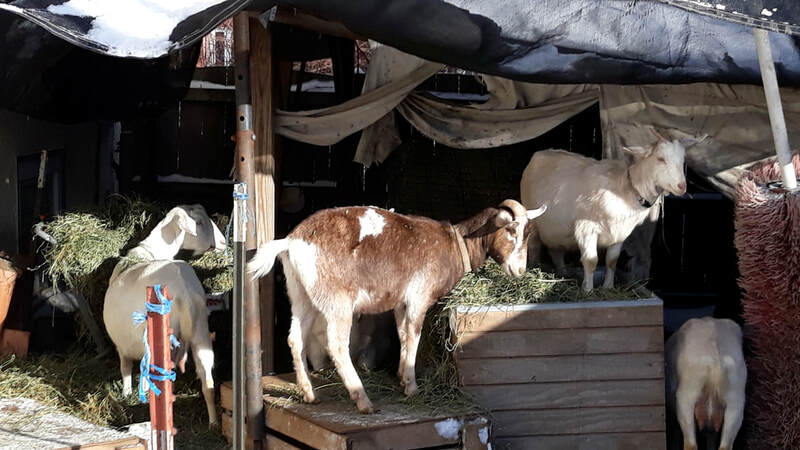 The goats were happy to be in the sunlight for some hours. We humans are unrecognizable as we bundle up with layer upon layer of pants, shirts, hats, socks, and scarves. Goats and chickens seem to be fine, we pray for the humans to be safe. Every year consists of a learning curve. This is the year of nutrition focus and health. I have been studying appropriate nutrition for our goats as they face having their babies in the spring. We have two first year 'fresheners' who are having their first babies. Making certain the kids grow in the womb without complications later, is a careful process. Grain amounts and contents help or hinder development of pregnant does. Two new elements have been added to their grain mix. Their current grain consists of a 16% calf feed which works fairly well. Our new policy is feeding them smaller amounts twice daily. Once a day I add Diamond VS yeast and kelp less than an ounce per goat. Mixed properly they will eat it with the grain. I feed it to them when they are particularly hungry in the morning and night. Too much grain too early in the pregnancy can cause toxic effects as well as babies that are too big to be born easily. Hay is important and vital. I spent time in the fall searching for a farmer with the right grass mix with alfalfa. Praise God Michael Uremovich has the number of bales we need for 2019. The alfalfa percentage works for us and still has its green chlorophyll which means it is stored well. Meanwhile the girls are waiting for spring. Hopefully we will receive a number of fairly warm days to walk to the pasture. Both Starry Night and Emma still appear quite frisky after their time with boys. Everyone will be ready to explore more space. Our breeders this year are located in Manitowoc,Wisconsin. Pat and Bruce have been breeding Toggenburgs since their daughter was in 4H. With gratitude we look forward to this year's kidding season with specific dates. The girls are bred with a procedures called hand breeding. They are carefully observed interacting with the boy goat through a fence, and at the right moment the doe is brought to the pen for the big moment. Here is the quote from Pat last week. Well, the girls finally are in love. We bred Abby late last week, Starry Night over the weekend, Esther came into heat yesterday, and Gracie this morning. We should be able to check them before they go home to be sure they conceived. Blue Moon, seen below, is a registered Toggenburg buck with great milking blood lines. 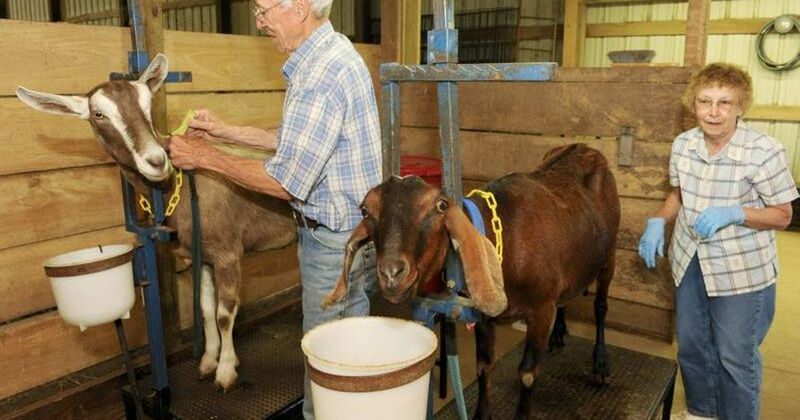 The other photo is of Bruce and Pat with two of their goats. They only breed Nubians and Toggenburgs . 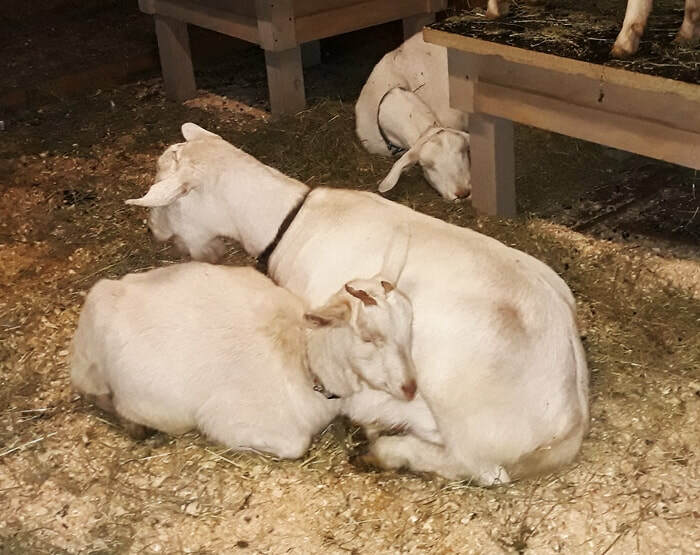 Nubians have long ears and Toggies are usually brown and white with airplane ears. Our babies this year will be brown kids. We are retrieving the girls after the New Year to start our new 2019 season. As the year ratchets down, the weather cools to a tepid 50 degree high. The wet weather of September is a lost dream as we enjoy the final weeks our our season involving milk production, breeding schedules and farm help. After several calls and emails, we now have a breeder with good qualifications for our girls. Their Date Camp has been scheduled for the week after Thanksgiving. While we now only milk once a day, with a decreasing production, strangely enough we are receiving emails and calls from new customers. Milk now sells out each week. Praise God for new customers who may benefit from our milk, Enrique Orosco has come to live with us and is helping us with the fall clean up as we put our garden to bed and clear the pastures of old hay and manure piles. We still have work in the cold weather approaching winter. Our accounting needs to be updated to the present. 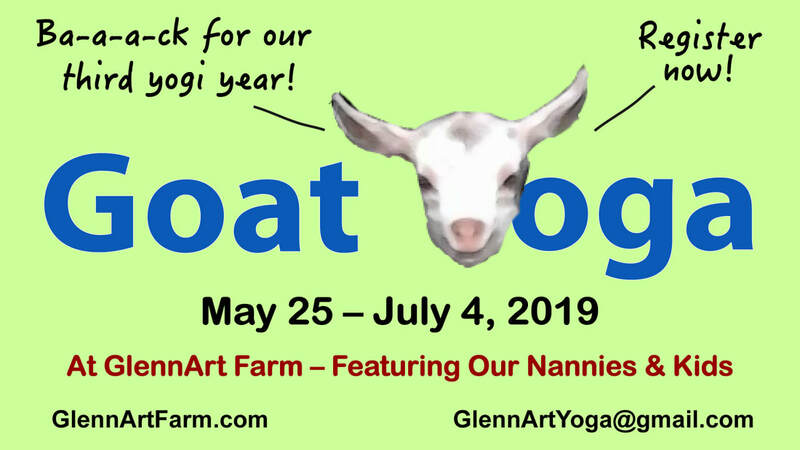 We've a few goat chill times scheduled in the next few weeks. I started to evaluate how to improve the feed of lactating goats for next year. I will be making another trip to Jefferson Wisconsin to visit Frank's Organic Feed Store. We need to stock up on hay for the January through April months. Reflections include deciding on writing grants, participating in fundraising of the Waller property for the next year and setting goals and objectives. May your fall be as gentle and pleasant as ours. On the second day of October, we took Martha to our local veterinarian. He reviewed her health after Dr. Vigil's evaluation, and weighed her at 88 pounds. In January, she started the year at 150. Martha could not maintain her health due to the loss of her teeth. 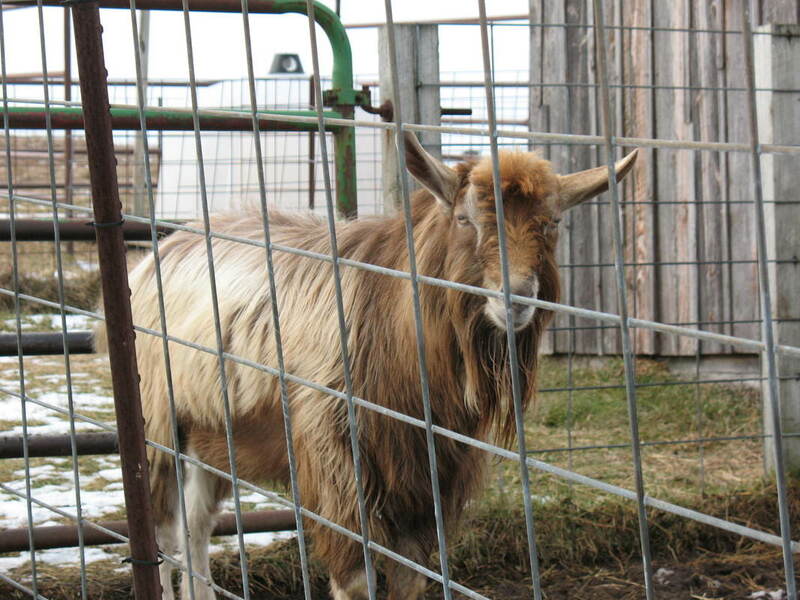 When a goat cannot chew and process grasses sufficiently, the animal will deteriorate. I learned a lot about goat teeth and check ever other goat's teeth once a year. She was six years old and our oldest goat. She was queen leader of the herd and our star milk producer. We could not understand her weight loss and she suffered an eye infection in the last two weeks. Once we saw her missing teeth, we realized the reason for her waning health. I will miss taking care of her; yet it is a release for all of us. The end of August and beginning of September are doubly busy. Weaning requires us to separate the babies from the mommies. Milking happens twice a day. The production of milk steadily falls until November. All summer long we review production and health of the nursing nannies. 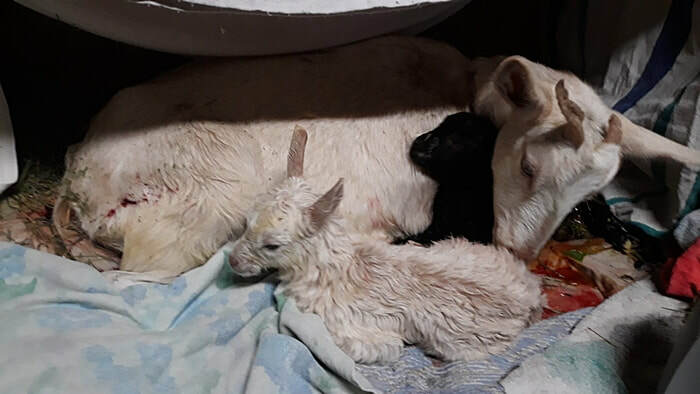 We also review the development of each kid analyzing them to see if they have the strength and potential to produce milk on an urban dairy farm. Still we managed to complete our permitting process in all the complexities. As for the mommy milk production, we have top production winners and problem girls. Gracie has become our queen this year averaging 4.5 of milk per day. Her babies are strong and healthy and she holds up in all the moving around we do. This year Destiny has two different illness and was off the milk line more than on. Illness produces high somatic countwhich is too high to sell to humans. Somatic counts are determined by lab samples sent to Wisconsin once a month. She has just gained good health and is now back on the milk line. Babies for next year to stay are Emma, Twist and Ophelia. Stay tuned for our announcement to find homes for the other kids.